There are two famous large temples located just within walking distance of Kyoto Station. These are Higashi and Nishi Honganji. They are both some of the largest temples I have visited in Japan and both are extremely important to Japan both culturally and historically. They are both free to the public and both are very similar in appearance. 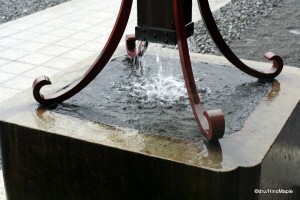 The first time I visited Kyoto was around 2006, and the second time I visited Kyoto was in 2009. Although the difference in time was only about 3 years, I can’t clearly distinguish the difference between the two temples. It can be very difficult, so visiting one temple only is not a big problem. If you are pressed for time, you don’t have to feel the pressure to visit both temples as you might be better off visiting only one of them and spending the extra time at another temple around Kyoto. In 2009, I visited Nishi Hongaji. Nishi Honganji was recently renovated, so the entire temple grounds are remarkably beautiful. The approach to the temple from the station is somewhat bland. There is a long wall stretching along the entire complex with gates along the way. The gates themselves are very beautiful with typical Japanese temple designs. Upon entrance into the temple grounds, you will be amazed by the sheer size of the main hall and the open area. Unfortunately, like my visit to Kinkakuji earlier in the day, it was raining heavily when I visited which made things difficult. On the other side of the coin, the fact that there was almost no one around made it a very enjoyable experience for me. Entering the hall is free and the hall itself is very spiritual. It’s hard to explain but whenever I enter a Japanese temple, I always feel a type of calm. Even with the rain and humidity, I felt very relaxed. The entire area may look and feel like a typical Japanese temple, but the atmosphere is the most important aspect of any temple visit. I can’t imagine a teenager visiting any temple and having the same feeling that I had but I hope they will. One of the more interesting aspects of the hall is the windows or rather wooden panels. 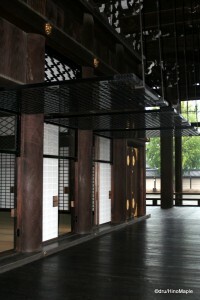 There are large wooden panels that line the sides of the main hall that allow more light and air into the hall. These are huge panels that hinge upwards. If you are lucky, you’ll be able to see these in use. The other interesting piece is the lights. There are several gold covered lamps located around the outer walk of the hall. From afar, they don’t look very unique or interesting but when you see them from underneath, you can see the detail of a dragon that has been sculpted into the bottom. It is not unique to Nishi Honganji, but it is still a very beautiful thing to see. When you are finished, you can always head to the adjacent office and relax a little. Higshi Honganji is the younger sibling of Nishi Hongaji. They are both different sects of Buddhism that have splintered away from each other. You can think of this as akin to the Orthodox and Roman Catholic churches. They are similar yet different religions. Higashi Hongaji was built 11 years after Nishi Hongaji and replicates the look and feel of Nishi Honganji. The main difference is that Higash Honganji is actually bigger than Nishi Honganji and there is a gold alter located inside Higashi Hongaji. Otherwise, it can be difficult to discern the difference between both temples. 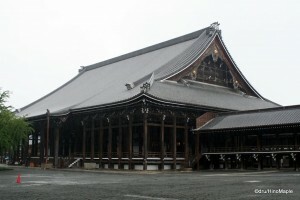 Both temples used to be in the same sect of Buddhism but due to political pressure, the temples were split up leading to the construction of Higashi Honganji. As I mentioned above, visiting one of the two temples is enough for a visit to Kyoto. While Higashi Honganji may be closer to the station, Nishi Honganji shouldn’t be overlooked either. If you take a bus, you can always stop at Nishi Honganji on the way to another location. Be sure to plan ahead and you can see a lot more. This entry was posted in Kansai and tagged Higashi Honganji, Honganji, japan, kyoto, Kyoto-fu, Nishi Honganji, temple by Dru. Bookmark the permalink.